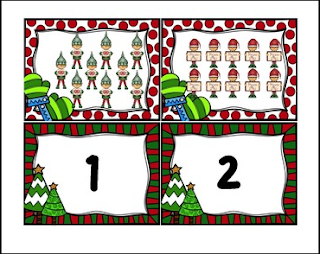 This is an elf / Christmas themed math center. It is perfect for preschool and Kindergarten, as well as, special education instruction. It is appropriate for the school and homeschool setting. Objective: Students will actively move around the room to count the elves in the pictures. Students will then write the correct numeral next to the same picture on the recording sheet. Optional: Clipboards for students to carry around to record their numbers. - Print and laminate the cards for durability. - Tape the elf themed object cards around the room. - Students will take a clipboard and go around the room searching for the pictures on their recording sheet. When they find the correct picture, they will count the objects and write the numeral on the line beside the picture. - I have included extra cards with numerals on them. You can use these to play a memory match up game with both sets of cards. Students will match the numeral to the correct number of apple themed objects. See my blog, Differentiation Station Creations, for more freebies and ideas! If you loved "FREE! Arctic: Even and Odd Number Sort, Center & Printables", you need to take a look at these games and activities!